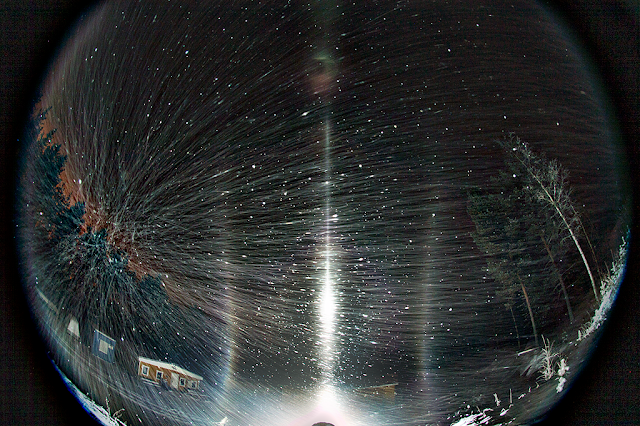 The display above, which I photographed this winter in Rovaniemi, was created by throwing snow in the air. It is quite common to have such man made diamond dusts, especially when temperature is below about -25° C. Just walking is enough to generate them. The resulting swarm is always small, no more than few meters across. 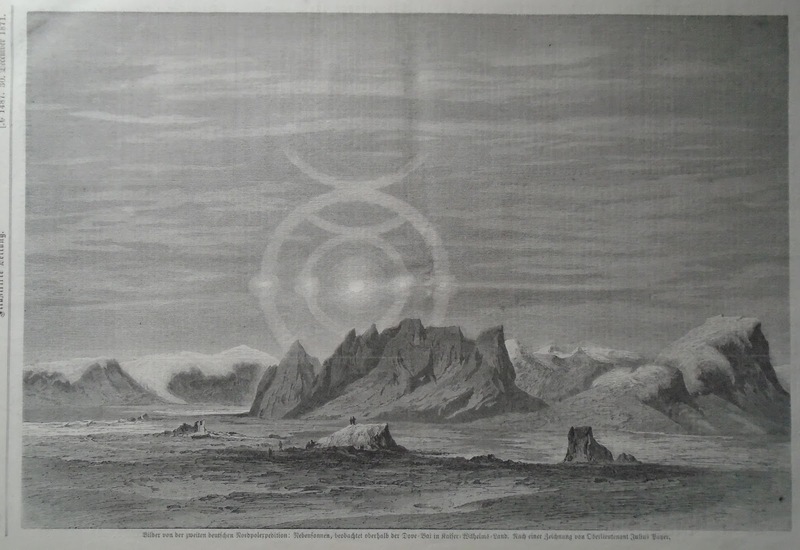 The etching shown above is based on the drawing of Austrian mountaineer, cartographer and landscape artist, Julius von Payer, and was published in the 30 December 1871 issue of Illustrirte Zeitung. The halo phenomenon was sketched in Dove Bay in the region previously known as King William’s Land, the northernmost area the Second German North Polar Expedition reached. In the mid-19th century, German ambitions to explore to North Polar region resulted in two expeditions. The first, in 1868, got as far as latitude 81°5' near Spitsbergen, but could not reach its planned destination and yielded no significant scientific achievement. The second one was a more extensive journey and aimed at getting to know the central Arctic regions with a planned wintering in the hitherto unexplored northeastern Greenland. It was on 15 June 1869, when the two schooners, Germania and its supply vessel Hansa left Bremerhaven. The captain of Germania was Carl Koldewey, who had already gathered experience in polar journeys during the previous German expedition. After about a month, the two ships met pack ice and got separated due to misreading the flag signs. Hansa was not fortunate: it was crushed by the ice and sank at latitude 70°32', a few kms from the Greenland coast. Its crew of 13 spent the winter in a coal dust briquette shelter and was finally saved. Germania, with its crew of 15 men, reached Sabine Island, where the wintering camp was established. In the autumn of 1869 and spring 1870, they made sledge explorations, reaching the northernmost latitude of 76°30'N. The investigations were led by Payer and the most significant achievement was the discovery of Kaiser Franz Joseph Fjord, named after the Austro-Hungarian emperor, who had contributed to the expedition with significant donations. The return of Germania was adventurous. The engine broke, but finally she defeated pack ice, and managed to return to Bremerhaven on 11 September 1870, mostly by using sail. The Illustrirte Zeitung article does not comment much on the peculiarities of the display witnessed by the explorers. 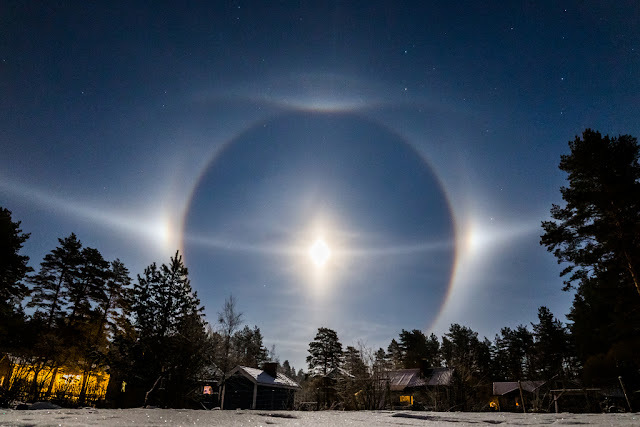 It explains that parhelia are formed by the reflection of sunlight on ice crystals and then explains that sometimes a double ring and colourful arches may form, and even a horizontal line starting from the Sun (i.e. : the parhelic circle). The article then continues with praising the magnificent colours of the display. A reflection subsun - or just rain streaks? Slices of reflection subsun have appeared a little off-set from the solar vertical at least in one display. 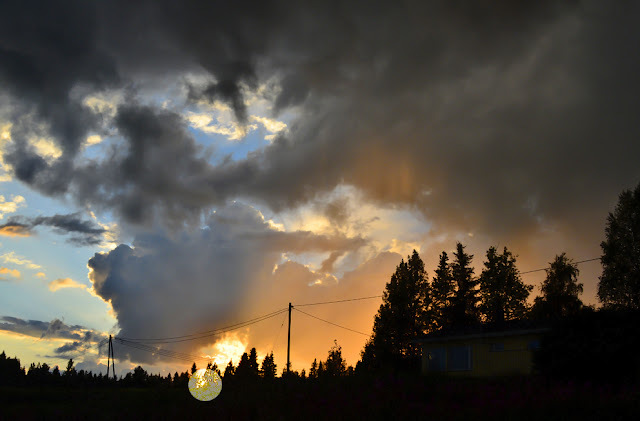 The image above, taken by Voitto Pitkänen in Kuusamo, Finland, on 27 June, 2015, shows potential to be another case and with a quite large displacement. A little right from the center of the photo are vertical pillars that bring to mind a sliced and displaced reflection subsun. The location of the sun is marked with a circle at the bottom of the photo. 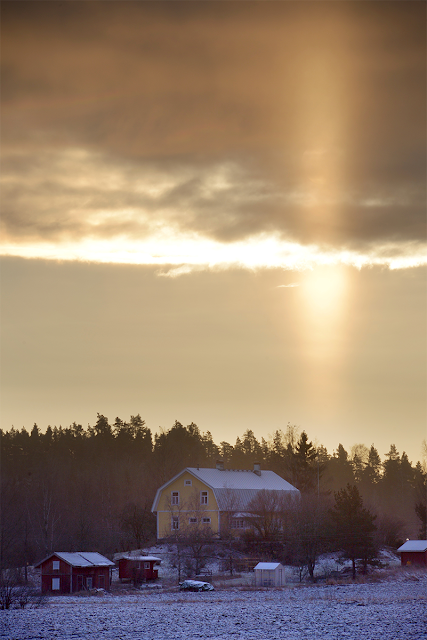 However, when this observation was submitted to Taivaanvahti and the reflection subsun interpretation was suggested, it was also quickly put in question by Tero Sipinen on the basis of the apparent low altitude of the stuff in which the effect appears. It seemed like ice crystals could not have occurred under those dark clouds in the middle of the summer. Atmospheric sounding data for that day, checked by Sipinen, gives additional support: freezing point was reached not until 4 km altitude from the ground. 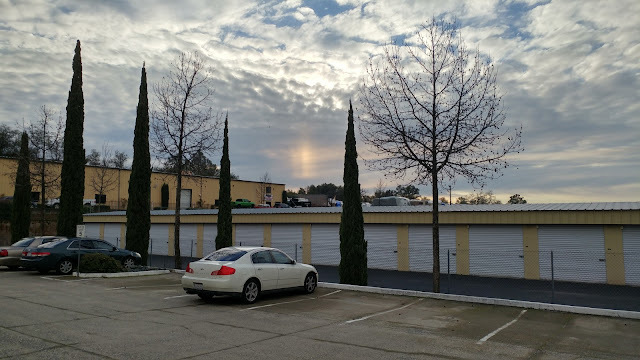 The clouds against which the pillars show up, are clearly lower down and thus couldn't have possibly precipitated ice crystals. So I am wondering, are these just sun lit rain streaks? According to Pitkänen, the clouds are remnants from thunder, so some rain can still be present. Actually, the intense orange twilight in the photo is probably due to falling rain. And in general, we are not used to seeing halos under cumulonimbus clouds. Do not shun away from the crappy stuff. On the night of 28/29 November 2016 diamond dust turned at one stage snowfall like, losing its glitter and much of its halos. My camera was on tripod snapping away shots and when the swarm suddenly became matte, I though of stopping photographing. 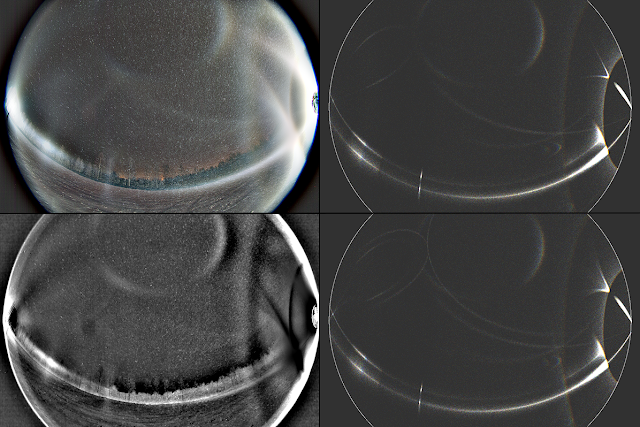 But there was something that kept me going: I could discern faint long arcs on both sides of the subsun. So I let the camera run - photos might turn up something interesting. Indeed so. The long arcs in the matte phase - shown in the single 30s exposure above - do not cross at subparhelia, but shoot past them on the outside. 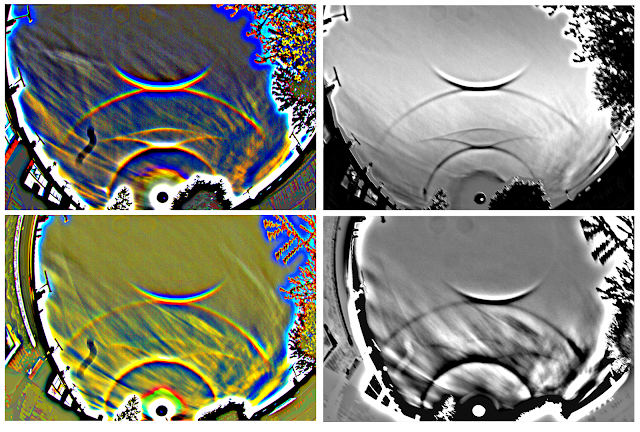 This is demonstrated in the collage below, where this image (lower left) and another image (upper right) from the earlier stage with subparhelia are superposed (upper left). Thus they are not the traditional arcs of Schulthess from Lowitz orientation. In addition to the unorthodoxy of the arcs, the disappearance of parhelia and subparhelia during their occurrence is also interesting. Futher below is an animation of most frames photographed in that session (only the final decline of the display was cut out). The arcs can be discerned in photos for about 6 minutes, but the peak was short, lasting only 1-2 minutes. So what are these arcs? I have only to give the usual answer: no idea. Some later displays, which I will post in time, seem to have them too and there are elements in those observations that point to the possibility of some kind of divergent light effect. But how that would be, divergent light simulations I have seen have not given out anything like this. So it is a mystery any which way you look at it. If they happen to be a real deal, then it must be assumed we already got photos of them in solar displays. In the time lapse below, the arcs that are seen between the parhelia and subparhelia before the long problem arcs emerge seem themselves tricky as well. Why they do not cross over subparhelia like properly behaved Schulthess arcs are expected to do? I would like to announce an exciting new initiative aimed at the whole halo community. For a long time, the Kern arc has been considered the “Holy Grail” of halos with only a handful of observations having been made and even fewer images captured. This year, I would like to invite all committed halo observers to really concentrate their energies on the area around the circumzenithal arc where the Kern arc appears. The aim is to try to photograph as many Kern arcs as possible this year, to better understand their frequency and to ascertain whether they really are the rarest of the rare. This initiative will go by the name of Project Kern. I think that many more Kern arcs may potentially be photographed if observers routinely focus on this area of the sky. In the past, many Kern arcs may have been missed by observers concentrating their efforts too much on the activity occurring below the circumzenithal arc. In this endeavour, always try to use a tripod and take a series of images for later stacking. In this way, I hope that you will be able to capture several more of these elusive halos in 2017. 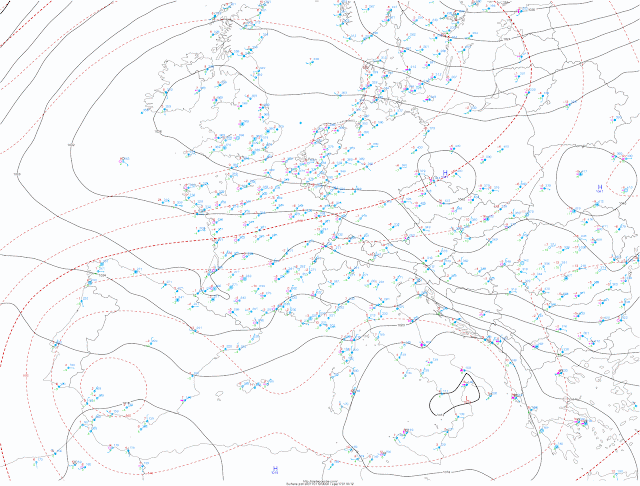 I am sure that once more observers start actively hunting the Kern, more examples will follow as a matter of course. I would very much like to encourage everyone to participate in this project and Halo Vault will be pleased to publish any Kern observation you might have the good fortune to make. Continuing our reflection subsuns tour, here is one four years back photographed by Sirkka Karppinen in Oulu, Finland. It has been evident in many a spotlight display, but in this case it is particularly striking: the other Schulthess arc is completely blue while the other one is predominantly red. This is not something we see in simulations, where both components are equally coloured. 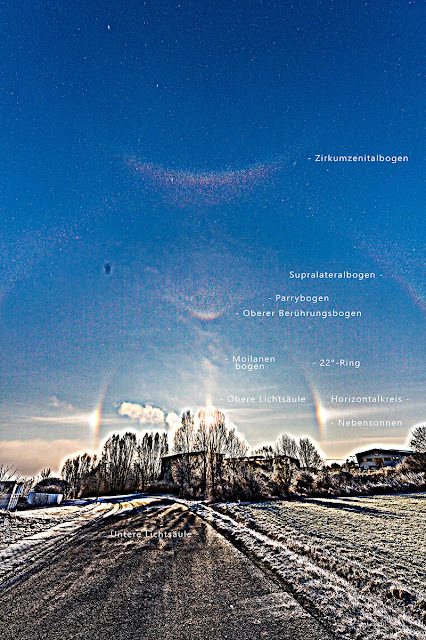 In the blue-red processed image above it looks like these two arcs split the spectrum of parhelia/subparhelia in two. I have of course no idea what is going on. Below is a more traditional version of the photo with heavily saturated colours. The display was photographed in Rovaniemi on the night of 28/29 November, 2016. 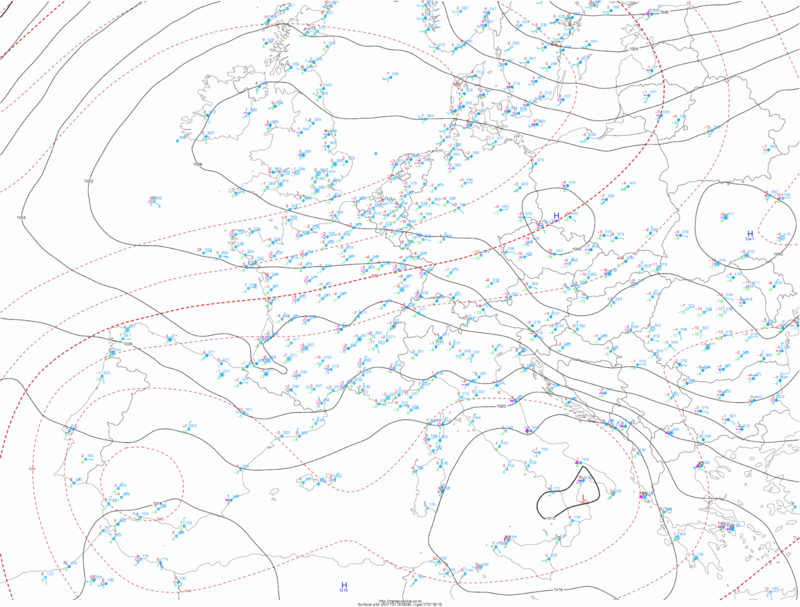 46° contact arcs are something of a true rarity. In the display shown above, photographed by Marco Rank yesterday in Jena, underneath the circumzenith arc is a concentration of crystals that could be due to one of the three components of 46° contact arc. 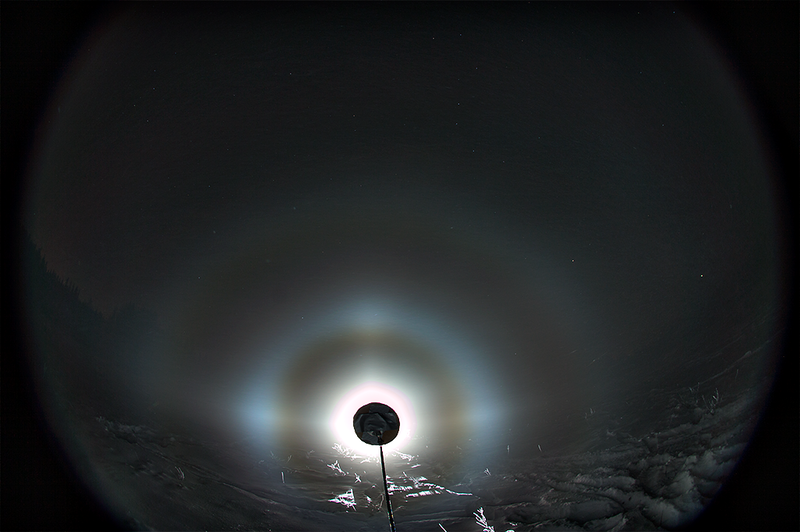 Or maybe it is just a patch of 46° halo from poorly plate oriented crystals. Below I have made simulations with both scenarios. On the left is simulation with Lowitz crystals that give the 46° contact arc. 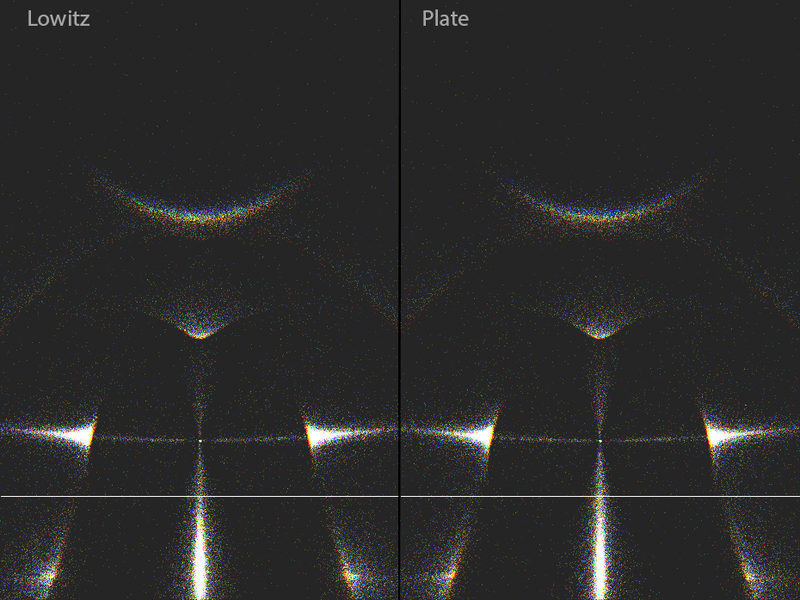 It makes makes a somewhat better delineated effect than the 46° halo patch of the poorly oriented plate scenario on the right, and is perhaps more in accordance with the photo. Yet this is just one photo in a sparse crystal swarm and thus not quite enough to draw firm conclusions. 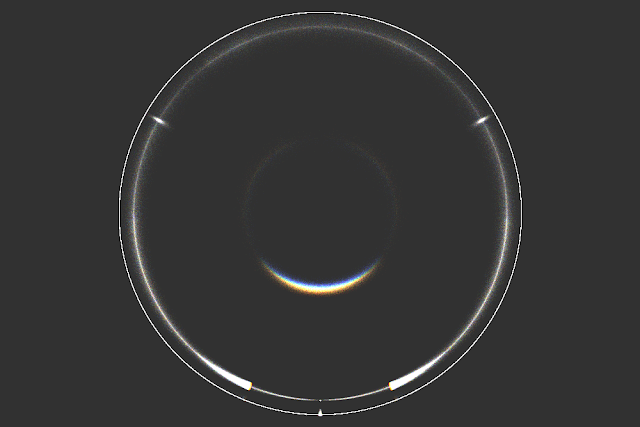 Whether it is 46° contact arc or 46° halo patch (or something intermediate), it is anyway interesting to notice that the Lowitz simulation gives no discernible Lowitz arcs - and that they are not seen in the photo either. Further below are simulation parameters for the Lowitz simulation. More photos of the display are shown in Marco's post in AKM forum. Why one of the cloud rays in the image above stands out by its copper coloring? That's what was in Juho Pöllänen's mind when he posted this and a handful of other images of his sighting in Taivaanvahti. It must be because it is a reflection subsun. A similar darker hue relative to lighter cloud rays has been evident in a couple of other observations too. Possibly the coloring takes place because of the additional distance reflection subsun light rays have to travel in the lowest layers of atmosphere. Pöllänen took the photos on October 10, 2015. 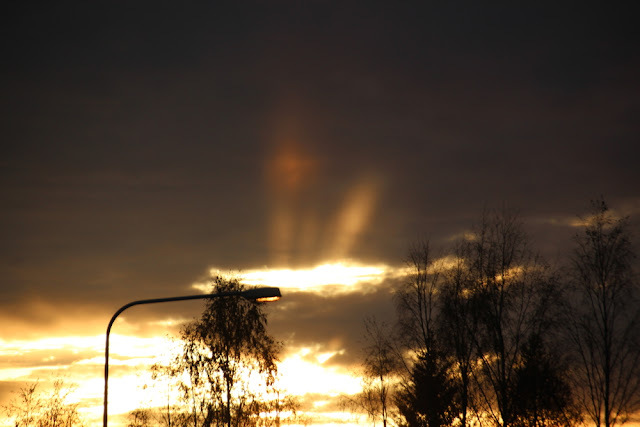 Another observation in Oulu, on May 10, 2016 by an anonymous observer, shows what appears to be a reddish reflection subsun low at the horizon. The image above shows an arc that points towards the bulge in sub-Kern. Its formation is unknown. We captured the arc first time on two occasions on the night of 6/7 January 2016 in Rovaniemi. The current case was photographed in Rovaniemi too, on the night of 28/29 November 2016. 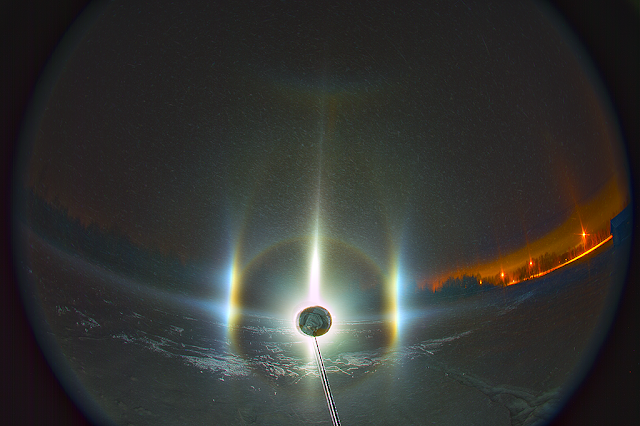 Judging from the crossing of helic arc and (what appears to be) Hastings over the 46° halo, the lamp must be around 3.5 degrees below horizon. I made some quick simulations. The upper one has plates, randoms, and Parry. 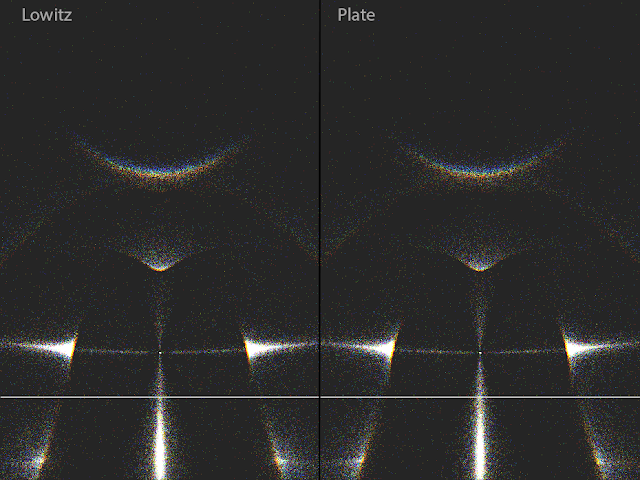 Plate shaped Parry crystals were used to get the relative intensity of the helic arc and Hastings somewhat comparable to the actual arcs. 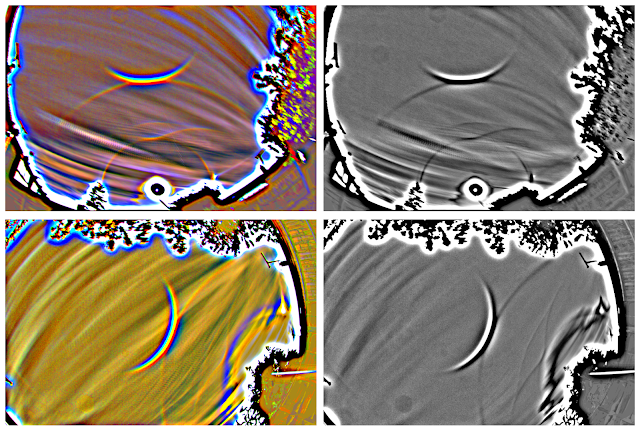 Simulation has also subanthelic arc, and it seems to be present in the photo, although it is quite broad and diffuse. The lack of Parry arc in the actual display is rather curious. 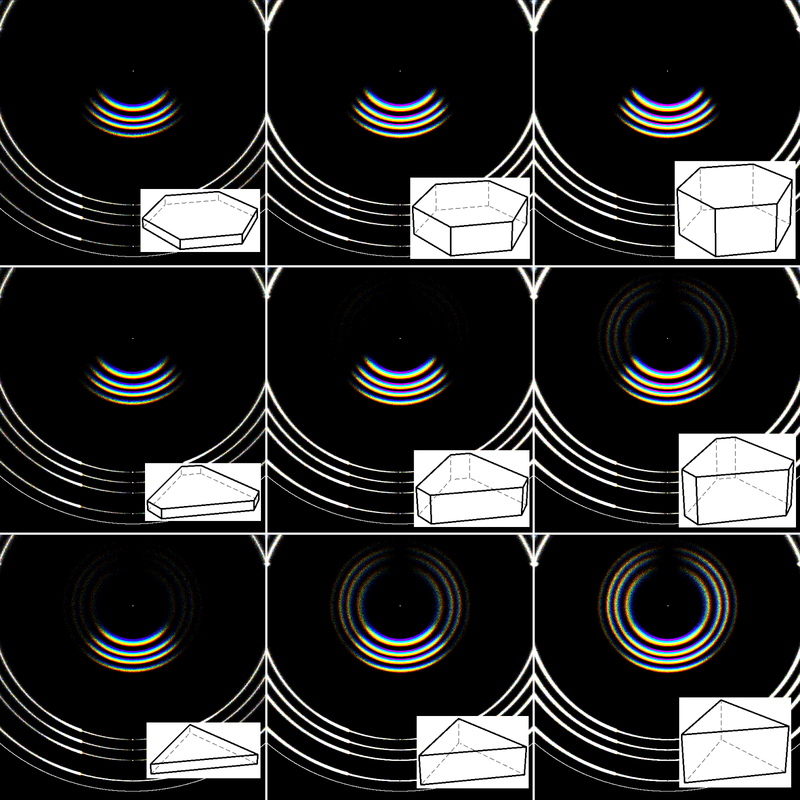 To make sure that the mystery arc is not some kind of anomalous singularly occurring Tricker, the lower simulation was made with added column oriented crystals. Sure enough, location of the Tricker does not match. The bulge in sub-Kern seems itself also anomalous and appears to be associated with the mystery arc. The bulge has not been photographed in the numerous displays without this arc. 6th January, 2017, I observed a quite clear reflection subsun in the southern Finland. Local time was around 11am. 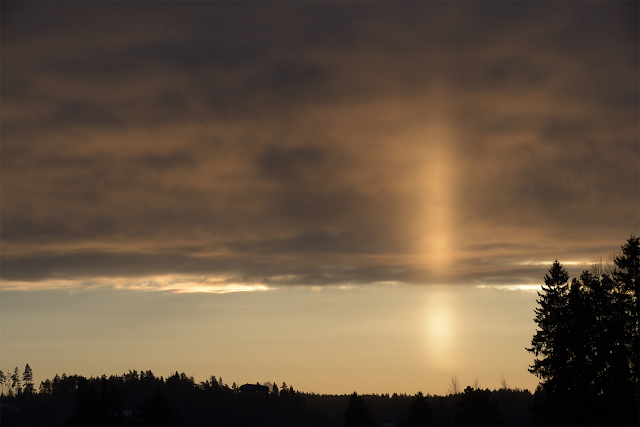 I looked outside and saw a nice sun pillar. Nothing special about it, but I decided to take a couple of photos of it anyway. I left outside rather hastily because there were clouds floating from north that would soon block the Sun. I got the pictures and stayed for a while longer and saw the clouds running over the Sun, as I had predicted. Surprisingly, the pillar didn't disappear. I waited for a little while longer but the halo was stubborn. Then I realised, the source was not the Sun, directly, but its reflection! The sea is about ten kilometres away. It was most likely frozen, but wasn't yet covered by snow. I also observed (probably) reflected crepuscular rays. If indeed so, it would probably be the first time ever that these two, refection subsun and reflected crepuscular rays had been photographed simultaneously. 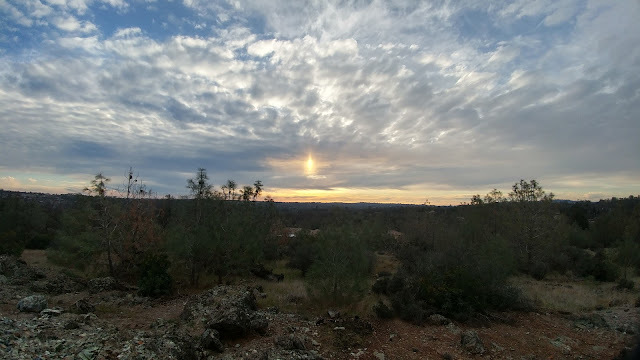 As I walked out of the building on the end of the workday on January 25, 2017 I noticed a bright patch on the clouds in the western sky that I immediately recognized as a reflection subsun. I had previously been fortunate enough to observe this phenomenon on Feb. 1, 2008, which I photographed and submitted to Spaceweather.com. Soon after the original observation I was contacted by Ágnes Kiricsi, who informed me what it was that I had seen as well as its rarity. Upon seeing this phenomenon again I immediately took a few photos on the spot and then began traveling down the road, stopping to take more photos when the view to the west became less obstructed by foreground objects. I also noticed that the effect seemed to be intensifying as the minutes passed. I decided to head to a hilltop a little over a mile north of my location and had hopes that I would have a better view from there. Once I arrived I was amazed at how much the reflection subsun had brightened and I took several more pictures. I wanted to continue to observe the spectacle until it disappeared but I had obligations that I needed to meet and could not stay any longer. The conditions under which I observed this phenomenon were nearly identical for both occasions. These included the time of year, the hour of day, the clouds and their positions, and very importantly, a very wet winter leading up to the observing date. This last factor adds uniqueness to the reflection subsun occurances that I witnessed due to the fact that the required reflective body of water is normally not even in existence! Approximately 60 miles west of my observing location in Auburn, California is a long north-south flood plain called the Yolo Bypass. It is normally dry but during periods of excessive precipitation it floods (by design) with water that the Sacramento River cannot contain safely. My local winter in 2008 was sufficiently rainy to fill this region with water but then the Bypass remained mostly dry every successive year until it flooded again in 2017. I will be sure to be looking for the reflection subsun on afternoons whenever the Bypass is full and the sun is obscured by altocumulus clouds. The 1 May 1875 issue of the Illustrirte Zeitung appeared with an exotic image showing a halo effect not much talked about. There seem to be two suns in the sky directly above each other. 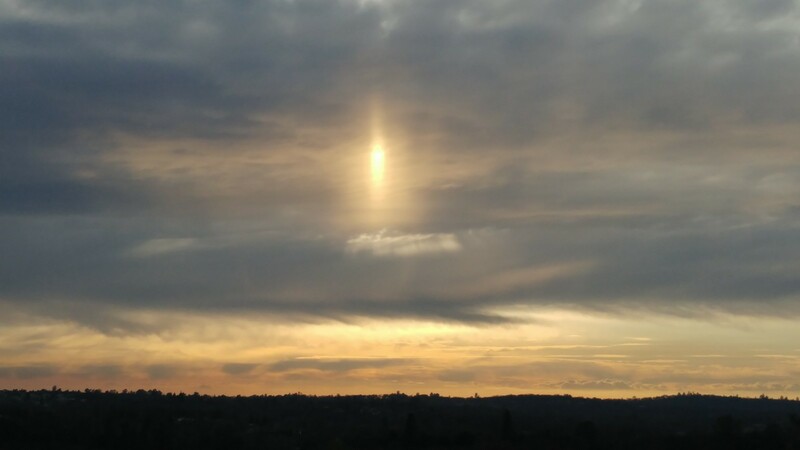 This could be the fake sun, or double sun effect, which is actually part of a sun pillar and can be observed when ice crystals are precipitating from the virga of Stratocumulus or Altocumulus clouds. The real Sun is covered by the edge of the cloud and the deceptive fake sun can be observed just above or below it on the icy virga. The phenomenon can easily fool a naïve observer, as this brightening looks very much like the real Sun. In the second half of the 19th century, there was growing interest in exploring the Arctic regions, with expeditions launched almost every year. The Austro-Hungarian Monarchy also wanted to have its share in the discoveries, and by 1872 Austrian and Hungarian aristocracy had donated enough money for the journey. 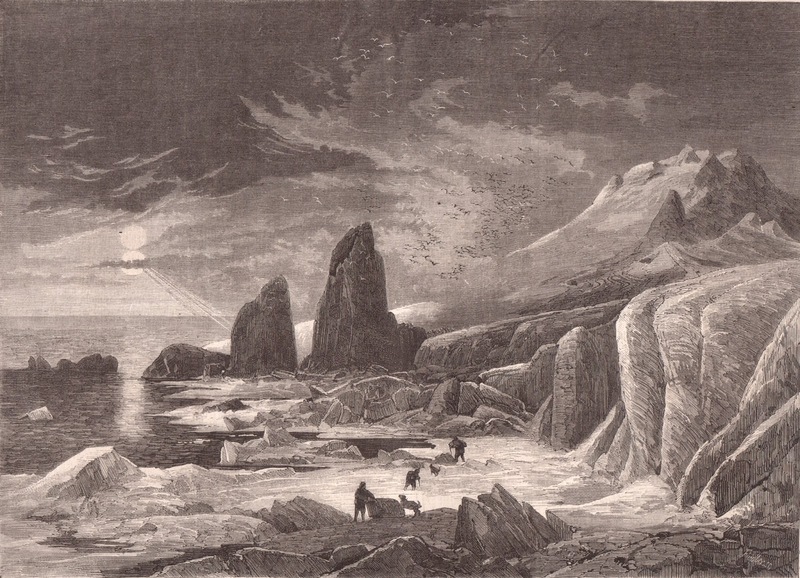 The expedition was led by Captain Karl Weyprecht and Julius von Payer, and their chief aim was to find the north-east passage along Siberia to the Bering Strait. The crew of the 40-meter long schooner Tegetthoff was recruited from all over the Monarchy. Just after a month, however, the sailing vessel got entrapped in pack ice, and started drifting up north. It never reached its goal, remained ice-locked for the rest of the expedition. The crew spent almost two years north of Novaya Zemlja living mostly on the meat of polar bears (they killed 67 altogether). Many of them got ill and one person even died, Tegetthoff tipped to one side, and finally in May 1874 the crew decided to abandon the ship. It took them three months to reach the open sea with dog sledges and boats, where finally Russian fishing boats rescued the people and took them to the Norwegian Vardobe. During their entrapment, however, Payer’s team had made significant expeditions, the most important of which being the discovery of the archipelago Franz-Joseph Land, named after the Austro-Hungarian Emperor. Payer organised sledge expeditions to map the area, one of which reached almost 82° North to an island which they named Rudolf Land in honour of the Crown Prince. It was this place where the fake sun effect was observed. The crew returned to the Monarchy as true celebrities, and accounts of their adventures and scientific achievements soon appeared in contemporary media. The woodcut image shown above is from one year after their arrival. The newspaper Illustrirte Zeitung dedicates more than a whole page to the praise of Payer’s own images and the paintings Adolf Obermüller created on their basis. This very image shows the momentous day when they reached the northernmost point of the expedition. In 1876 Payer himself published his book about the journey titled Die österreichisch-ungarische Nordpol-Expedition in den Jahren 1872-1874. 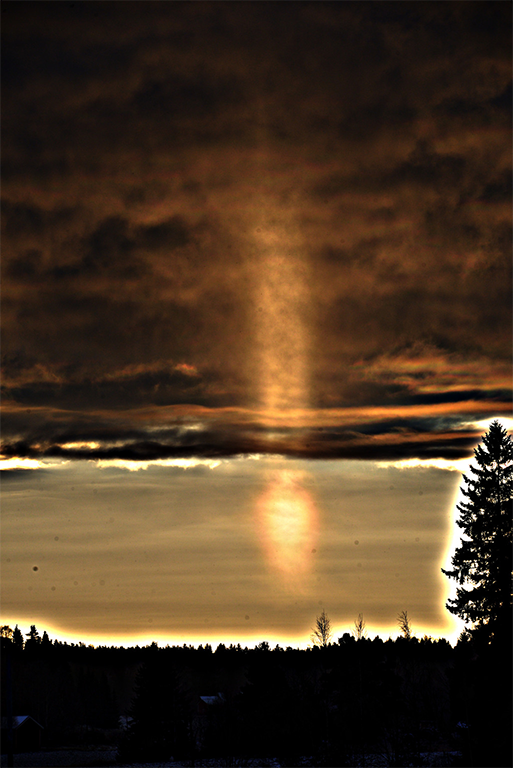 An almost identical image of the fake sun can be found in this opus, but perhaps showing the sun pillar a bit better. Payer himself did not write much about the fake sun. We only know that during the observation the sky was covered by thick clouds, and a second Sun was visible, though it looked “matter” than the real one. If the woodcut really shows a fake sun, this account might be one of the first documentations of the phenomenon. Marko Riikonen has collected some early observations, the most noteworthy of which is probably that of Giovanni Cassini’s from 1693. On his page, Riikonen also shows images of a 2009 observation by Julie Bronson from South Central Minnesota. http://www.taivaanvahti.fi/observations/show/38958 for the June case. In overall terms, the two displays are almost identical. Apart from the Kern arc, there is little to suggest particularly strong presence of oriented plate crystals. Of course, parhelia and circumzenith arc (CZA) stand out in the processed stacks, but in single frames they don't appear too extraordinary. Furthermore, part of the CZA intensity obviously comes from Parry-oriented crystals, which are not thought to contribute to the Kern arc. Even without the Kern arc, the displays would be rather extraordinary in my opinion, thanks to the presence of Tape and helic arcs, neither one often seen in cirrus displays. The June display takes this aspect even further by additionally containing the Hastings arc. Other halos present in the displays include the common ones produced by random, column, and Lowitz orientations. There appears to be some common thinking that the Kern arc benefits from very low solar elevation. Against that background, the solar elevations in question here seem high (16°-19° in the April case, 18°-21° in June). Had the Sun been a few degrees lower in the sky, the distance of the Kern arc from other halos of interest and from the Sun had been too much for me to catch it in the first place, as I was not specifically searching for it and my personal toolkit does not contain an all-sky lens. But after all, I am not so convinced that the solar elevation makes such a big difference, except possibly when it comes to judging the likelihood of Kern from the intensity of CZA. 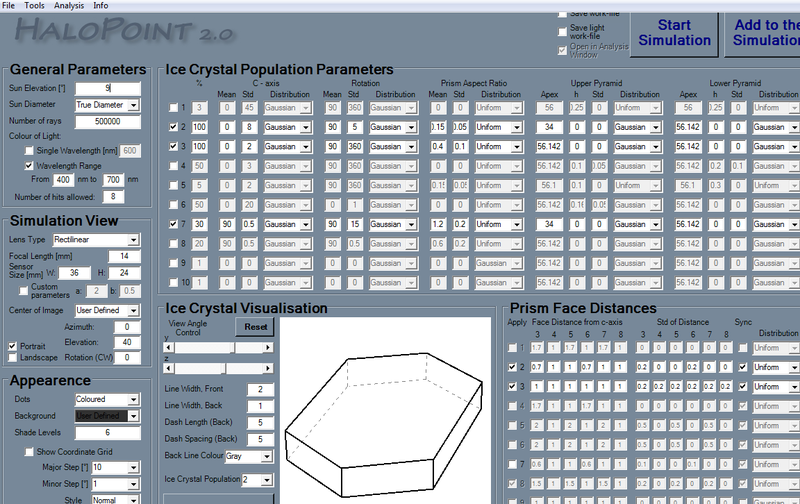 To illustrate the effect, I produced a set of simulations using the Halopoint software and assuming oriented plate crystals with varying aspect ratios and base shapes. The results are combined in the figure below (each panel contains solar elevations 5°, 15°, 20°, and 25°). With regular hexagons (panels on the top) I get no Kern at all. 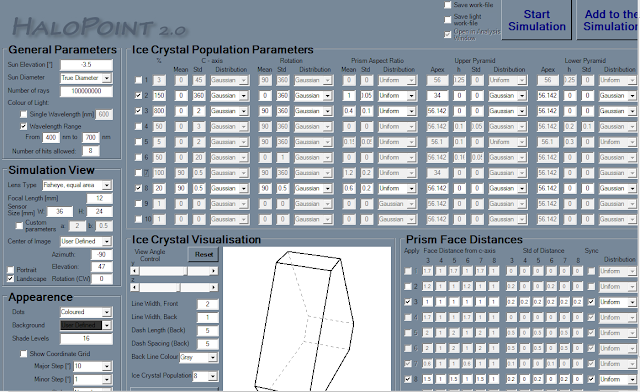 With regular triangles (bottom panels), I get a decent Kern regardless of the solar elevation, unless the crystals are very thin. Intermediate crystals in the middle row make a decent Kern only if they are thick. In none of the cases does the lowest elevation show the most intense Kern - I'd rather say the opposite is true. Vesa Korhonen photographed this lunar display in Hämeenkyrö in the evening of 10 February at 2038 local time. The circular Lowitz arcs are splendid. The upper and lower components are expected to accompany, and seem to be there, but are rather overwhelmed by the intense 22° halo. On January 21st, after a long stretch of not getting any significant halos and not too long after observers in Hungary got a spectacular display, I observed a nice display here in the USA. The highlights of this one were the nice upper tangent arc and the 46 supralateral arc. I also got 120° parhelion too. 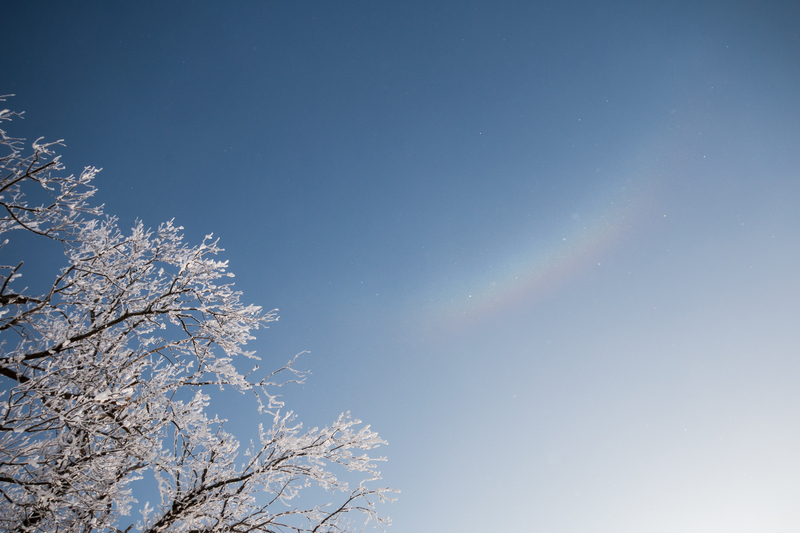 Have secondary parhelia made their appearance already this winter somewhere? If not, then here is the first one. On 8 February Kai Kotivuori was skiing on the Pielinen lake, and took a couple of photos of a bright plate display. 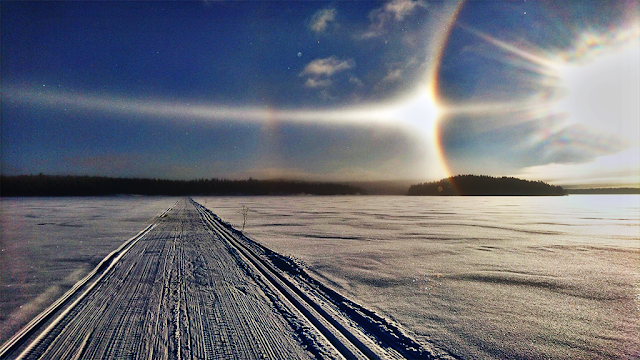 One photo was framed so that we can see also 44° parhelion. Following evening an anonymous observer was fishing burbot around the same area and took photos of a lunar display showing lowervex Parry. At the night between 18th and 19th January 2017 me and my friend Daniel decided to try our luck and head towards the Bílá ski centre (approx. 50 km away). Before we headed out, we checked the webcams located at the centre. 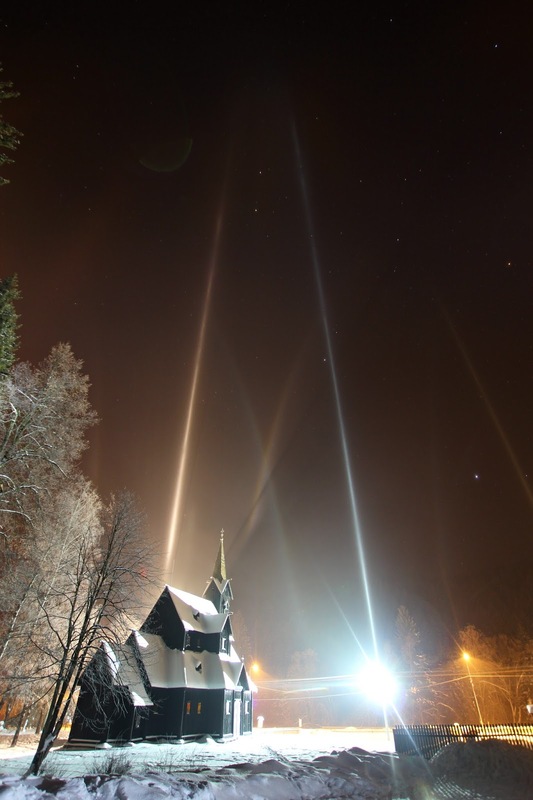 All cameras showed sharp and tall light pillars extending out of every light source. Faint superparhelia were visible, too. The crystal swarm was extending 3 km away from the centre itself. 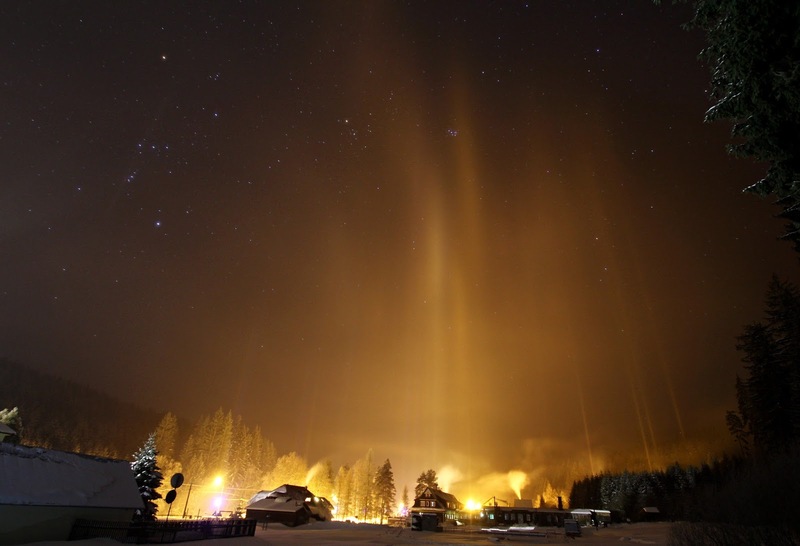 On the way there, upcoming cars spawned tall light pillars and visible parhelia. Just as we arrived, the centre closed down and turned off the lights. We parked near the slope and noticed that it was completely overcast. The crystals were in the form of very thick fog that was hanging in the valley. More on the "weather side" later. As we walked for a few hundred meters away from the centre, we stumbled upon a very bright lamp illuminating a local church. 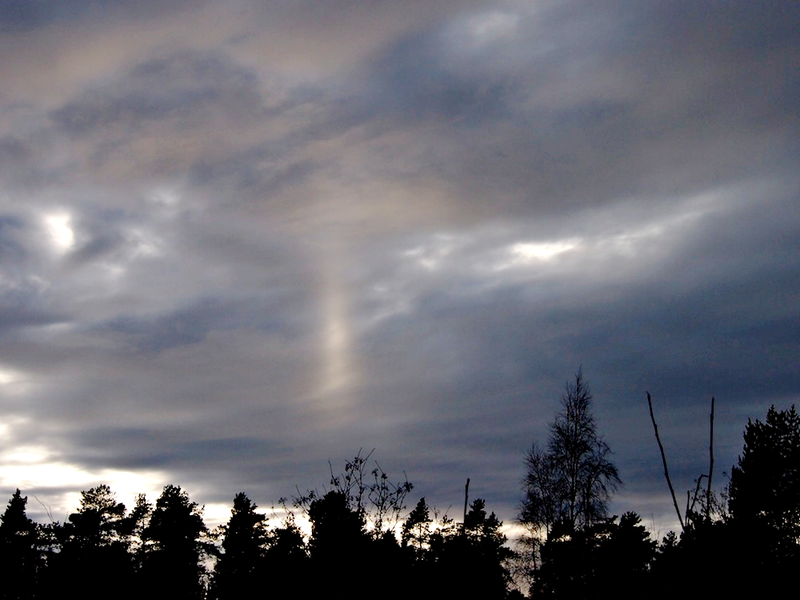 Only a sharp and tall light pillar was visible. But as we stayed for a little longer, the whole situation changed and superparhelia started to appear. At first they were hardly noticeable, but with each minute they were getting brighter and brighter. We decided to try our not-so-much bright "spotlight" to see if anything interesting appeared. And yes it did. By shining the lamp towards the snowy surface, true divergence took form and divergent sub-parhelia appeared. They were eerily 3D, hanging in the air. 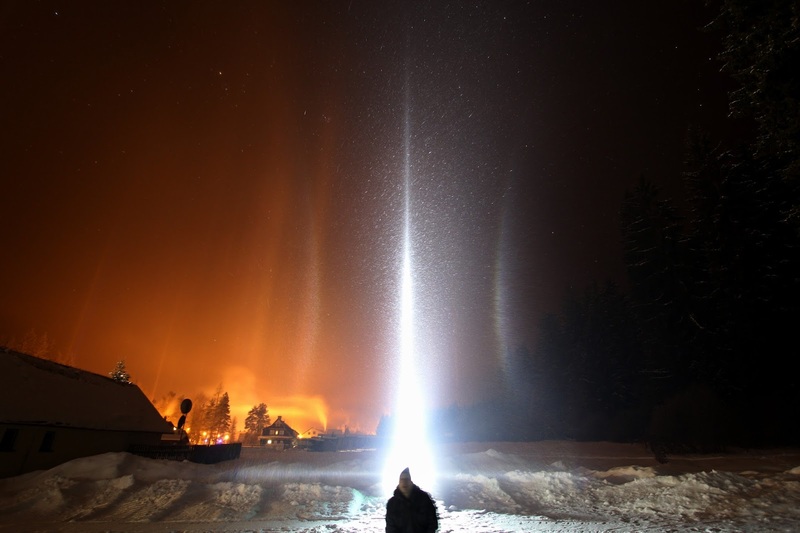 Along with them, an extremely bright and tall light pillar was observed, too. Now let's discuss the weather situation a little. The temperature reached below -16°C which was lower than other temperatures observed at meteorological stations (due to the topography). The ski centre was at the time actually located at the edge of a low hanging stratus that was just barely touching the mountain ridge. 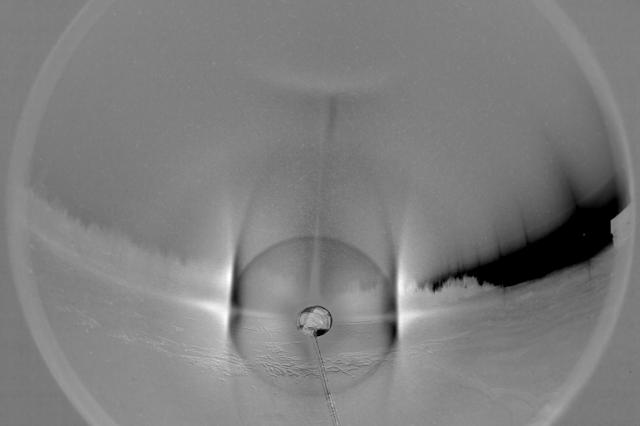 The snow guns then probably nucleated its lower layer and the crystals started to precipitate out. Below is a georeferenced image from the Suomi-NPP satellite along with the location of the centre. The microphysical product along with a high resolution of the image shows how the edge of a low stratus (yellow colour) extends towards our location. Now bare in mind that this image was taken approx. 1 hour after we left, so the stratus actually retreated a little by that time. There are two "branches" of a low stratus visible at the image. The right branch follows the exact location of a local dam called Šance. The left branch follows a river called Čeladenka. Microclimate - the topography is in the form of a depressed valley, which allows for a cool and moist air to accumulate at the bottom. Snow gun additives - if I have learned well, it is the additives in the snow guns that serve as nuclei on which the crystal formation takes place. In that case, they are probably using a specific additive that makes the crystal formation so abundant. 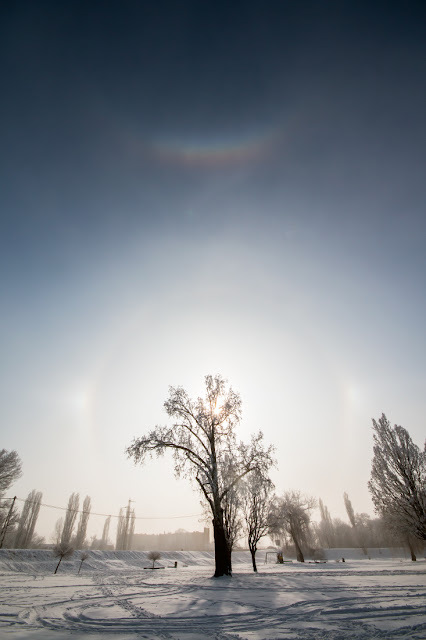 Diamond dust halos are scarcely observed phenomena in Hungary, mostly because of our climate. When it is cold enough, dry airmasses of Siberian origin fill the Carpathian Basin. But when the air is moist enough, it is not really cold. 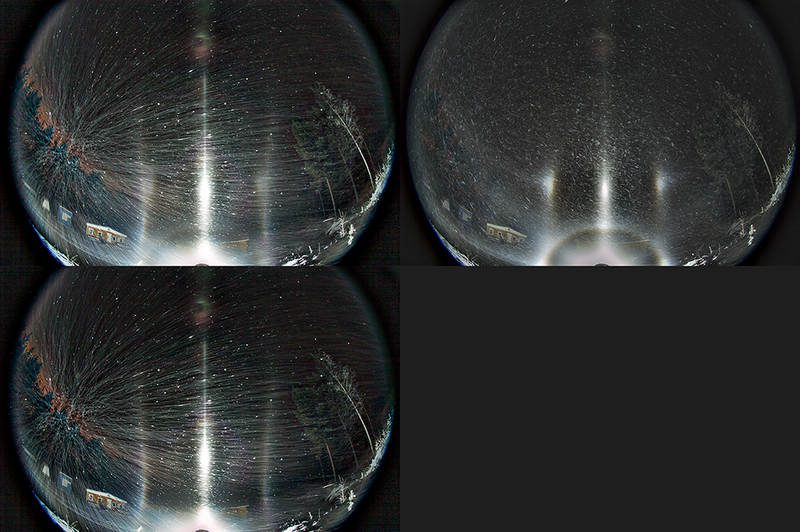 Special locations, however, share some attributes needed for diamond dust formation: at ski resorts with snowguns, for example, condensation seeds are present. Interestingly, this year’s Hungarian diamond dust observations, show a different type of seeding. In winter Hungary usually has some weeks of high pressure weather which in our case means cold, foggy days with only a small amount of sunshine once in a while. These weeks help accumulating a dense, highly polluted air, especially in valleys (while the highest hills still might be clear). 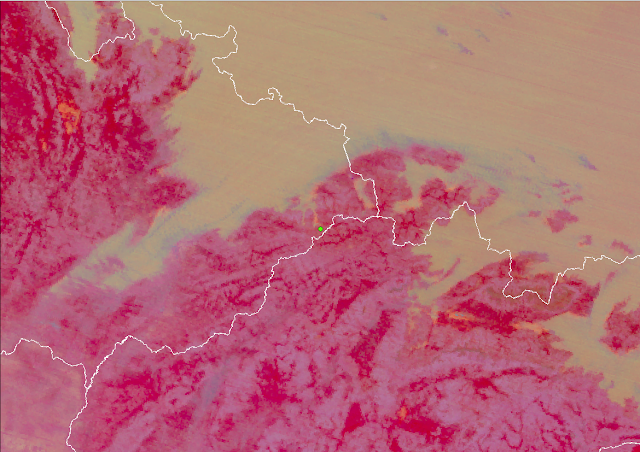 If the temperatures are low enough, and there is enough moisture present (imagine a river valley for example where fog formation is always possible), and these circumstances coincide with local air pollution, diamond dust might form, no matter if it is industrial or due to high traffic or heating. 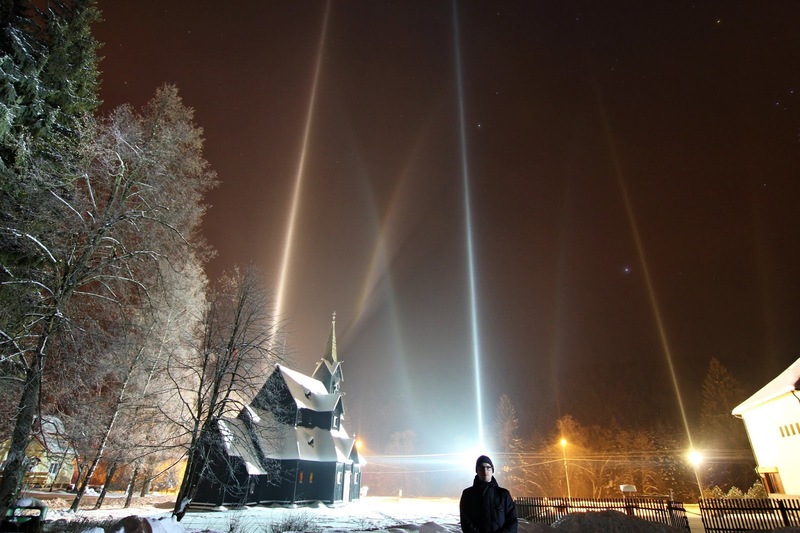 Still some kind of light source is needed for any halo... We see diamond dust falling without any optical side-effects on grey, foggy days, and sometimes when it happens at night, we might see light pillars. During rare hours when the Sun decides to look at our pale faces there might be some sundogs, 22° halos, sun pillars, tangent arcs, CZA too. But mostly we see only a small amount of diamond dust glinting around us in the air, maybe a weak subsun with it. 90% of these displays are very faint, last only for a short time and are limited to a small area. My personal experiences from this winter have been that almost every foggy night there was some diamond dust falling. It, however, made not even a single light pillar, as it was observed only within a 20-30 meter area. Typically, I could only see diamond dust forming around one certain house which was wooden heated. 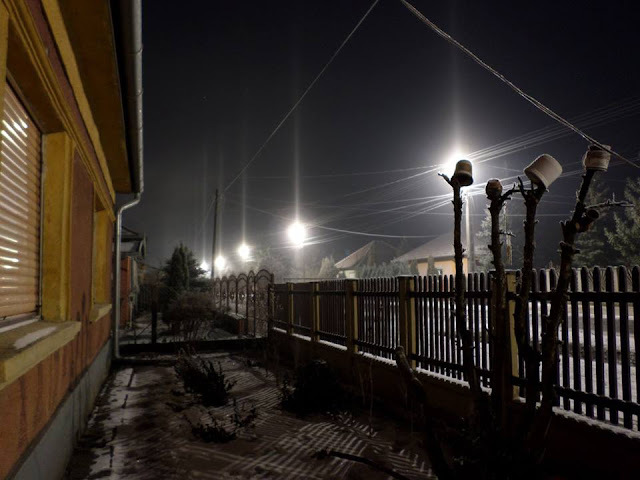 Ákos Ujj saw similar cases around a central heating supply building near his home ‒ although farther away the conditions (fog and low temperature) were the same. Tibor Tátrai is our ‟diamond dust king” as he has the most abundant observations in our country. For some years he has been collecting these observations from his village and the nearby town where he attends school. Both places have air pollution, the village because of the heating, the town because of a small industrial district near the road which he travels each day and where he usually sees diamond dust halos. He also has temperature records for these observations and it was not uncommon to see a diamond dust halo with only -3,5 / -6°C instead of the more proper below -10°C temperatures (still this winter he was at the lower edge with several light pillars seen with -15/-17°C). He lives at Tápiószőlős which lies at a lowland with lots of small creeks and irrigation channels nearby ‒ these keep the moisture high there. Similar circumstances are present at his school town (only 10kms from the village) and there is also a highway right beside the industrial district, so maybe industrial and traffic air pollution is added up there. Another location where a nice display appeared and lasted for about 1,5-2 hours is Hatvan, a town by a main highway and also with a river. That town also has some industry but not any special air polluting type (and a new gas-heated power station which is not producing condensation seeds). Lowitz - the new normal? 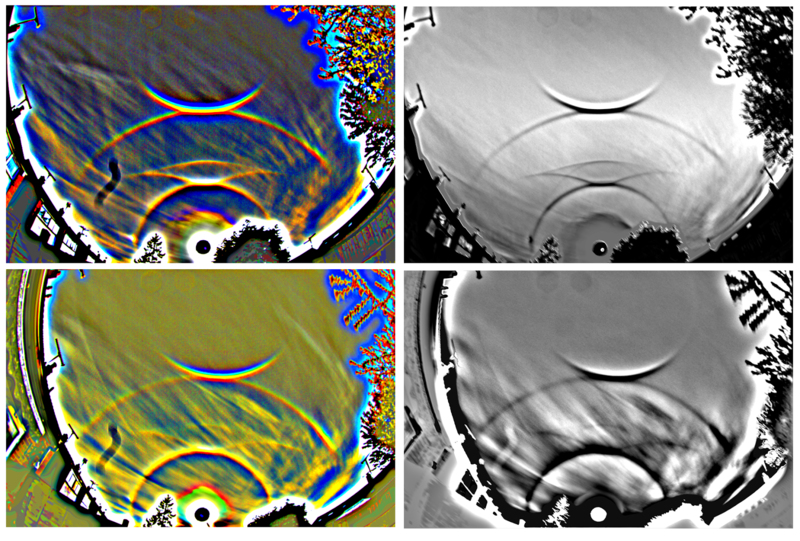 Do clouds slice reflection subsuns?